Apart from Google Play, Android allows users to install apps from external sources. This is a handy feature for users to try out apps that aren’t available on Google Play due to regional restrictions or several other reasons. The method to install apps from external APK sources is quite well-known. You enable app installation from Unknown Sources under Settings >> Security, then download the APK package of the required app and install it to your device. Once installed, it blends in with your other apps and you can use it just as any other app installed from Google Play. But unlike Google Play Store apps, apps installed from third-party sources cannot be updated automatically over the air, since Google Play does not recognize them as purchased apps. If you want to update apps installed from external sources, you need to download the updated APK from an external source and run it on your device, so as to overwrite the previous version. But there are two major concerns that need to be addressed here. How do you find a trusted source for downloading APKs? 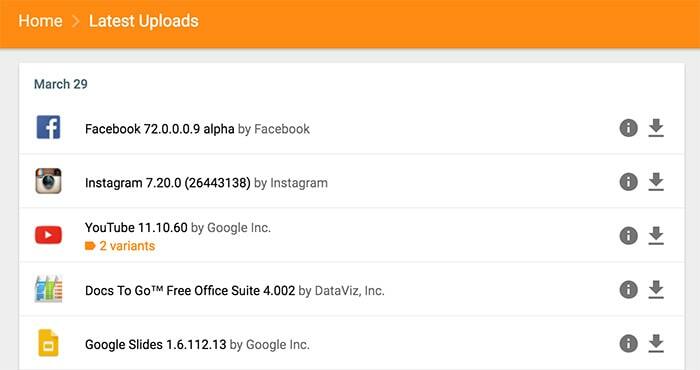 When installing updates, you’d be downloading APK files from particular repositories more often. But it is quite difficult to pick a source which is trustworthy enough to offer clean and unaltered APKS that are malware-free. How do you know when a new version of an app is available? When updates are available on Google Play, the app automatically notifies you. This is not true for any app installed externally via APK. Thus, even if you get a trusted source for downloading APKs, manually checking them for an app update is tedious and rather inconvenient. With these concerns in mind, we have found a workaround for receiving app update notifications for non-Google Play apps. APKMirror is an Android app repository that hosts apps directly uploaded by developers. It has a dedicated team that works round the clock to ensure that all APKs uploaded to the repository are authentic and safe to download. It was launched by one of the most popular Android communities, Android Police. Thus, the APKs uploaded to APKMirror are official and trustworthy as well. Note: APKMirror has a no-piracy policy and does not host paid apps. On very rare occasions, some developers make updates to paid apps available to the public, usually to test beta releases. In such cases, there is usually a license check involved to make sure the apps were previously purchased. MX Player Pro is a notable example of such an exception. You can read more about APKMirror in this post or visit the FAQ section of the official website. APKMirror uses Pushbullet integration, and you can subscribe at a variety of levels — all new APKs, all APKs from a certain developer, or just APKs for a specific app. Whenever an app update is available from a certain subscription, Pushbullet will notify you of it. And you can get the desired updated APK from APKMirror. Download and install Pushbullet app on your Android device. Register or sign in to Pushbullet using the app. Go to APKMirror.com on your Android web browser. Search for an APK, an app or a developer. The search results will be available in three different tabs. Click on a particular result to open the APK-specific page. Here, click on the Subscribe via Pushbullet button (the rightmost icon on the top row of the Description box) to view all related subscriptions. Select a particular subscription. You’ll be redirected to the Pushbullet to confirm the subscription. Once subscribed, Pushbullet app will notify you when updates are available from your subscribed apps (or developers). Just follow the respective link in the notification to download the update from APKMirror. APKMirror hosts APKs for most of the popular Android apps that we generally use. And you can download APKs for all the different versions of a particular app that was ever uploaded on the website. That means, you may downgrade an app to a specific version by installing it from the respective APK file, provided it’s already available on APKMirror.